Maybe it’s because we live on opposite sides of the Georgia Straight that I don’t think it’s such a bad idea leaving out a spare key for my mother. I’ve heard grumbles from young men about their nearly next-door mothers crashing their bachelor pad, bearing home-cooked meals and clean laundry. Such complaints are a dream to me and I was certainly grateful to come home to my mom this week. Vancouver has been hot the last few days (though not as humid as Toronto, I hear). Mom knew just how to handle it. I arrived home off the bus to cold Mike’s Hard Lemonades in the fridge and fresh ingredients for a very seasonal salad. Into a big bowl I tossed…. Tossed with a balsamic-honey-olive oil dressing and paired with a slice of super-seeded Cobs bread, we feasted! The following day, after a cruising cycle around Stanley Park (could we pack anymore people onto English Bay’s beaches?? ), Mom did what moms do best: spoil their children. This particular spoil was a trip to Whole Foods. Yep, that heavenly, posh, over-priced-but-worth-it-for-the-experience grocery store. We took our time perusing the salad bars before filling several boxes (rest assured, they were decomposable) with veggie pakoras, prime rib chilli, macaroni and cheese, and, oh right, vibrant grain-n-greens salad. This time we sat on my little deck to feast! Despite the heat, my mother insisted on making caramel corn. And I wasn’t going to stop her. (I just stayed out of the oven-heated kitchen.) This is a bit of different take on her original recipe. She was experimenting, hoping for a real caramel coating. Be warned: This stuff may put you in a buttery coma. Heat 1 tbsp of the oil over medium-ish heat in a pot with a lid. (Did you catch the italics? Lid = vital. No lid = popcorn everywhere but your mouth.) Pour in the kernels and cover with the lid. Next, use the same pot to melt the butter. Mix in the sugar, let it melt, and bring to a boil. Keep it stirring. Once the two have mixed thoroughly, stir in the sweetened condensed milk. Let this simmer for a good few minutes. Meanwhile, turn your oven to 350*F and line a baking tray with aluminum foil and either spray with Pam or oil it with a pastry brush. 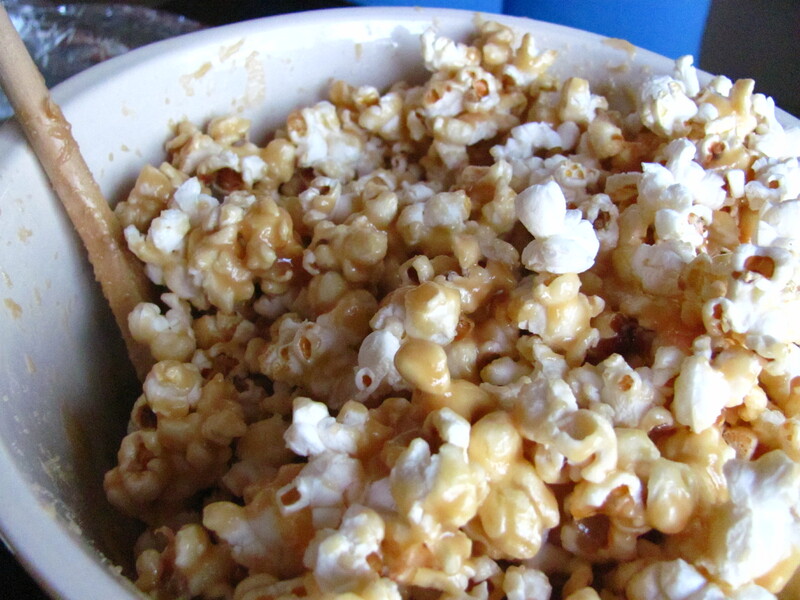 When the caramel is ready, pour it over the popcorn and mix to coat. Spread this all out on the foil-lined baking tray and pop into the oven for about 12 minutes. Make sure to pull it out every 6 or so minutes to turn the popcorn. The idea is to get the caramel a bit crispy all over. Last weekend I went to Portland, Oregon and dined at the lovely Papa Haydn. 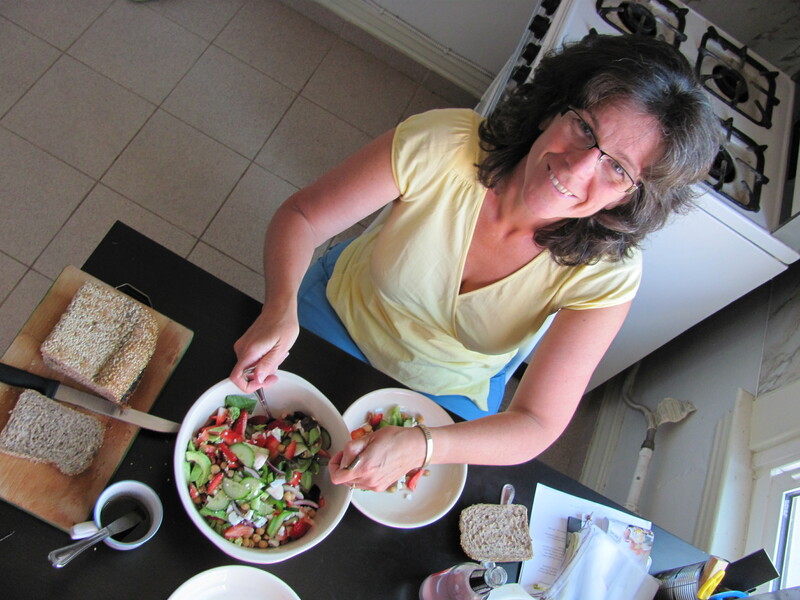 Although my chorizo-fennel mussels were lush, Michele’s dinner choice reminded me how much I love cucumber salad. Thus I had to make my own! With carrots too, which were included by default of love for their colour. 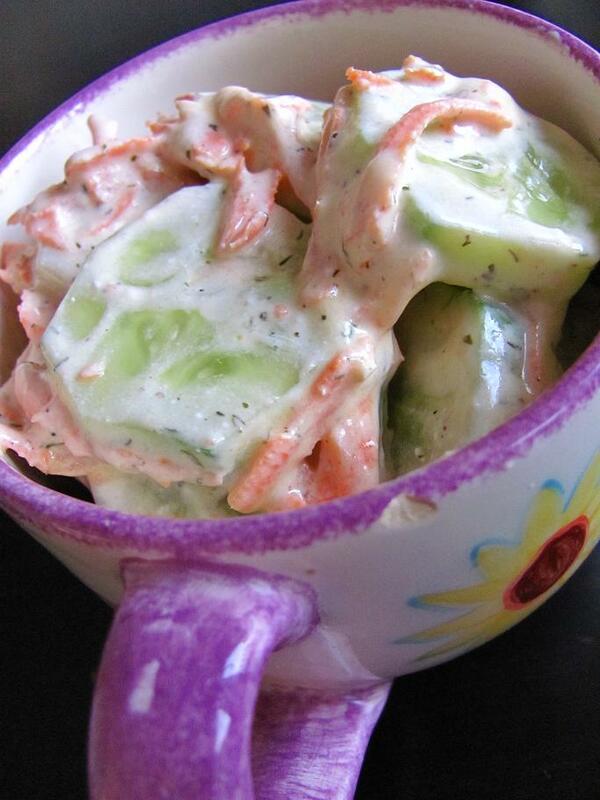 Combine everything, minus the cucumber and carrots, in a small bowl. Then toss ’em in and coat thoroughly. You may need to add more salt, to your taste. This salad was paired with a sandwich of Silver Hills flax bread spread with basil pesto, homemade hummus, avocado, and filled with sliced zucchini, tomatoes and lettuce. An apple, cherry yogurt and two homemade oatmeal-banana-pecan-chocolate chip cookies also found their way into my tote.